We recently published an article arguing in favour of Georgia’s proposed ban on selling agricultural land to foreign buyers. A foreign landowner with several years’ experience in the country’s agricultural sector uses his right of response to argue against the move. 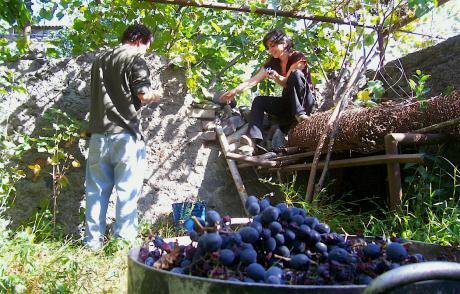 The grape harvest in Kakheti, a region of eastern Georgia famous for its winemaking. Photo CC-by-2.0: Joe Colne / Flickr. Some rights reserve. In this article on Georgia’s proposed ban on selling agricultural land to foreign buyers, Sopo Japaridze makes a number of excellent points: in policy, the needs of Georgia’s rural population should have priority. They make up more than 40% of Georgia’s population, yet are often neglected. She also makes the sensible point that Georgia imports far too much food (though it is unlikely to be quite the 80% that she cites). However, the proposed solution — banning foreign land ownership — is unlikely to be the solution for either of these problems. Right now, the main problem in Georgia is that most land is not actually being farmed. By some estimates, as much as 50% of Georgia’s arable land lies fallow, being used for grazing at best. Foreign investors can contribute to putting this land to use by bringing skills, capitals, and access to international markets. These investors can also bring employment, and can help to revive agriculture, through some anchor investments. Foreign investments have already led to employment, to increased standards, and have helped to export Georgian products to Germany, Japan and other destinations. It might have been useful to highlight this dimension, given the current discussion. It is also sensible to keep focusing on exports. First, Georgia needs export revenue, to buy the things it does not produce. While manufacturing jobs are desirable, they cannot be conjured out of nothing. Next to tourism and hydropower, agriculture offers a sensible source of revenue. Export requires high standards, which are in demand in Georgia, too. Currently, many farmers over-use pesticides and herbicides, and while most Georgian produce looks wholesome and tastes delicious, a chunk of it is not particularly safe. One case in point is the recent US health warning about high levels of lead in Georgian spices. That is just the tip of what unfortunately is a far-from-healthy iceberg. Exporters, particularly those to Western European markets, are held to high standards, with regards to residues. They are, incidentally, also held to standards with regards to labour safety. Thus, working to export standards can bring the quality and productivity that likely will contribute to reducing imports, too. In Georgian agriculture, we have a long way to go before we reach a zero-sum game of either exports or imports. To be sure, not all investment (foreign or Georgian) is great, getting the details of regulation right is difficult. The details are complex. I do wish that future articles on this issue take account of that complexity, and contribute to a nuanced discussion. In Georgia, and all across the former Soviet Union, there is much misery today, because of hot-headed decisions that were taken on impulse, in the past. The right answers often are not in extremes (“any investor in!”; “all investors out!”), but in identifying sensible trade-offs. Journalism contributes to developing such policies when it highlights the complex mechanics that are at play, and illuminates the unintended consequences that could result from courses of action that appear superficially attractive, while leading us down some unhappy paths. Hans Gutbrod has been working in and on the Caucasus region since 1999. He is also active in agriculture, and believes in its potential in Georgia, if the right decisions are taken.